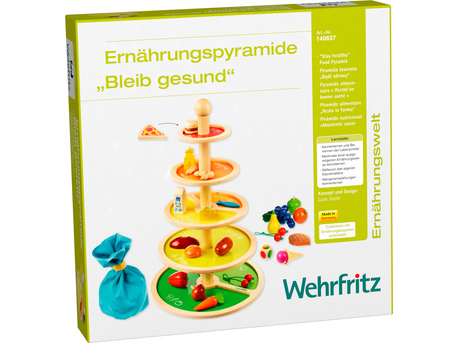 The high-quality 3D Food Pyramid encourages players to match the foods made of wood to the differently colored levels of the pyramid. The colors of the levels and the symbols shown on them help in matching and at the same time act as a traffic light display: the foods on the green level can be eaten in plentiful amounts, those on the red level should only be eaten occasionally. In a demonstrative way, players learn about the food groups and their importance for a healthy diet. The instructions contain information, game ideas, and ideas for use in preschool, school or therapy. 1 food pyramid with 5 levels (detachable), 39 wooden food items, 1 cloth pouch, 1 color die, 1 set of instructions. Material: wood. Dimensions: Ø 40 cm, height 50 cm.